In the tiny outback town of Dunkeld in Victoria, Australia, it's a nightly occurrence to spot a sommelier dashing across the highway clutching a bottle of Domaine de la Romanée-Conti, Château Latour or Penfolds Grange. Plucked from a giant, climate-controlled cellar, a steady stream of prize bottles make their way to The Royal Mail Hotel, a rising star of destination dining. The Royal Mail Hotel sits on the volcanic plains between the striking mounts of Sturgeon and Abrupt, in the Grampians National Park. It takes quite an experience to lure diners to drive from Melbourne (more than three hours), Adelaide (six hours) or Sydney (12), but The Royal Mail Hotel fills almost every one of its 32 seats five nights a week, often with repeat customers. A primary appeal is the 2,700-wine list and 26,000-bottle cellar that supports it. The cuisine sets a new benchmark for fresh, seasonal Australian produce. The kitchen team begins each day in the property's extensive gardens, harvesting nearly every vegetable, fruit, herb and flower they will serve that evening. Their olive grove supplies olives, free-range chickens offer fresh eggs, and resident bees provide honey. Every meal is harvested, prepared and cooked by the same hands on the same day. Nothing is left in the refrigerator overnight. Two dining options are offered: omnivore ($169) and vegetarian ($141). Each of these set menus comprises a gastronomic odyssey of 10 courses. The simplicity of natural flavors is the focus, but always with a creative twist; executive chef Dan Hunter is never afraid to push the boundaries. Dry-aged jumbuck and flathead sashimi are surprisingly complementary with salted dandelion. Egg yolk, salt fish and crackling with new potatoes combine for a captivating contrast of textures and flavors. Local lamb is treated gently to maintain its tender texture, and the fresh seafood is line-caught off the Victorian coast. The cuisine is matched by one of the most extensive and best-priced wine lists in the country. At the top end, many of the great wines of the world are offered at little more than retail prices. Wine lover and hotel owner Allan Myers purchases Burgundy and Bordeaux en primeur and carefully cellars every bottle (just across the road from the dining room) until each is in its prime, ensuring not only value but provenance. Sommelier Jeremy Burke skillfully handles local acquisitions. Deep verticals of Bordeaux feature all the greats, and Burgundy is similarly strong. Domaine de la Romanée-Conti commands two pages of the 97-page list, featuring vintages back to 1969 Grands Echézeaux ($1,866). Riesling spans a wide selection from Alsace, Germany and Austria, around a natural focus on Australia. Australia's icon wines all star here, with verticals including Penfolds Grange back to 1975 ($891) and Leeuwin Estate Chardonnay to 1985 ($243). The hotel is located close to the border between the wine regions of Grampians and Henty, so wines from Victoria are rightfully showcased. Local Shiraz is a hero, and seven vintages of Mount Langi Ghiran Langi Shiraz extend back to 1996 ($139). Mount Mary Pinot Noir reaches back to 1979 ($207) and Giaconda Chardonnay to 1991 ($425). Opportunity at the affordable end of the spectrum is refreshingly extensive, with close to 70 bottles priced less than $50, including McWilliams Mount Pleasant Elizabeth Hunter Valley Sémillon 2001 ($38). A series of nine glasses of wine accurately matched to each menu is also offered ($113), representing a diversity of countries and styles, national icons and older vintages. The Royal Mail Hotel achieves a unique balance between warm, country hospitality and high-street polish. The dining room is comfortable, modern and spacious, if unremarkable; the focus remains firmly on food and wine, and the relaxed setting showcases that without distraction. The skilled staff remains friendly and relaxed while ever attentive and efficient, leaving patrons with only one dilemma: whether to order the matched wines or delve into one of Australia's most extensive cellars. The best approach may be to bring a big group and keep the sommeliers running back and forth across the road. 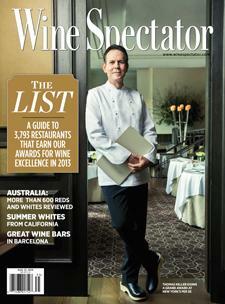 Australia-based Tyson Stelzer is a frequent contributor to Wine Spectator.